There are times when you can make a whole meal from a healthy, filling salad. When it is this tasty, it’s easy to serve yourself a nice bowl of this colorful dish with a little crusty bread, a glass of a cool, light Pinot Noir and call it dinner. Peel the butternut squash and sweet potatoes and cut them in small ½- inch cubes. Place the cubes in a casserole dish. Add ¼ cup of olive oil, 1 tablespoon of cumin, 2 teaspoons of salt, and a pinch of paprika. Mix thoroughly, cover with a sheet of aluminum foil, and place in the oven for 30-45 minutes, until the vegetables are done but still firm enough to retain their shape. 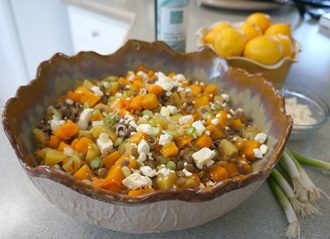 While the squash and potatoes are baking, cook the lentils. Rinse and place the lentils with non-salted water in a large sauce pan with 4 cups of cold water. Bring to a boil, reduce the heat and simmer for about 30 minutes. The lentils should have a soft bite when done. Drain. Remove the butternut squash and sweet potatoes from the oven and let cool to room temperature. Prepare the dressing: In a bowl, mix the lemon juice, olive oil, and a pinch each of salt, pepper, and cumin. Finally, gently fold all of the ingredients together, including the Feta cheese and onion. For a different version, use chopped bacon instead of Feta cheese. Both versions should be served at room temperature for the fullest flavor.